Featuring the latest SATA III 6Gb/s interface and advanced SandForce controller, the SSD320 provides ultra-fast sequential read/write speeds of up to 560MB/530MB per second and maximum 4k random file writes of 87,000 IOPS. Perfect for use as a system disk and for completing everyday tasks in a timely manner, the SSD320 takes a mere 32 seconds to boot Windows 7 and just 20 seconds to transfer a full 4.7GB DVD file. Due to their industry-standard 2.5" form factor and super slim thickness of just 7mm, Transcend SSD320 drives allow straightforward user installation in notebook computers, mainstream PCs, and today’s high-end Ultrabooks. What’s more, the SSD320 contains no moving parts to offer cool, silent operation and excellent resistance to shock and vibration. Transcend SSD running fast, clean, and error-free, the advanced SSD Scope software application is available to download and work with the SSD320. SSD Scope allows you to monitor SSD320 health status with S.M.A.R.T. technology, enable the TRIM command in the operating system to help maintain optimum write speeds, and conveniently update SSD firmware, all from a single user-friendly tool. For operating systems that do not support the TRIM command, the SSD320 offers an aggressive garbage collection and recycling system. To further increase the lifespan of the SSD320, built-in wear-leveling and Error Correction Code (ECC) ensure continued reliable data transfer. SSD Scope also includes a convenient System Clone utility to help make upgrading your existing computer to the performance boost of an SSD320 quick and easy. Performance Upgrade Featuring the latest SATA III 6Gb/s interface and advanced SandForce controller, the SSD320 provides ultra-fast sequential read/write speeds of up to 560MB/530MB per second and maximum 4k random file writes of 87,000 IOPS. Perfect for use as a system disk and for completing everyday tasks in a timely manner, the SSD320 takes a mere 32 seconds to boot Windows 7 and just 20 seconds to transfer a full 4.7GB DVD file. 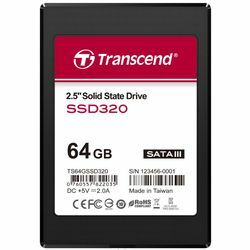 Due to their industry-standard 2.5" form factor and super slim thickness of just 7mm, Transcend SSD320 drives allow straightforward user installation in notebook computers, mainstream PCs, and today’s high-end Ultrabooks. What’s more, the SSD320 contains no moving parts to offer cool, silent operation and excellent resistance to shock and vibration. Built-In Reliability Transcend SSD running fast, clean, and error-free, the advanced SSD Scope software application is available to download and work with the SSD320. SSD Scope allows you to monitor SSD320 health status with S.M.A.R.T. technology, enable the TRIM command in the operating system to help maintain optimum write speeds, and conveniently update SSD firmware, all from a single user-friendly tool. For operating systems that do not support the TRIM command, the SSD320 offers an aggressive garbage collection and recycling system. To further increase the lifespan of the SSD320, built-in wear-leveling and Error Correction Code (ECC) ensure continued reliable data transfer. SSD Scope also includes a convenient System Clone utility to help make upgrading your existing computer to the performance boost of an SSD320 quick and easy.